To those celebrating today, Happy Easter! I'm trying to pace myself with the Reese's Peanut Butter Eggs. XD It's also April Fool's Day, and I wish this were an April Fool's joke: I posted once last month. :/ I wasn't going to bother with a March recap, but I did read 2 books and 1 short story last month, which is a lot more reading than I've been managing lately. I've got a couple of reviews backlogged, which should be posting soon-ish if I remember to type them up. I still do things old school, lol, preferring to write my reviews on paper first. It's an extra step, but in an ever-increasing digital world, I'm clinging to my paper! 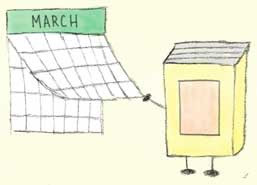 Happy April reading and blogging, everyone! Happy Easter!! And yeah same here wit the chocolate- I'm scarfing it down today!! Happy Easter to you, too, Greg! I'm trying to have some self-control with all of the chocolate currently in my refrigerator, but it's sooo hard, lol!